The Barr Brothers Biography (in 3 acts) “What would an ocean be without a monster lurking in the dark? It would be like sleep without dreams.” -Werner Herzog Act 1 Interior; montreal 2008; cross-section of two adjoining apartments. Brad Barr and Sarah Pagé meet when Sarah’s harp playing drifts through the thin walls separating their two apartments. He is inspired and attempts to learn her music through drywall. They meet and become friends. Sarah, an experimental harpist, had been playing with various orchestras and performing with the esteemed singer Lhasa de Sela. Brad, a recent transplant from the US, had played for years with his brother Andrew in the Providence/Boston based band The Slip. He had followed Andrew to Montreal after a fire in a Montreal club they were playing sparked a romance that took them over the border. 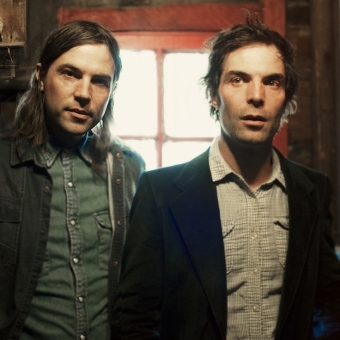 The two brothers and Sarah began playing and recording together in their makeshift studio, ultimately producing their debut record, The Barr Brothers, “…a dusty journal of hushed Americana, West African grooves, and voyeuristic lyrics, rich with artifacts…”. Act 2 Exterior; the Grand Canyon, 2012; band is set up on the rim. Rounded out by multi-instrumentalist Andrés Vial, the four band members have been touring relentlessly since their record was released on Secret City Records. The wiling quartet decides to set up on the rim of the Grand Canyon and asks the tourists to film the charade on iPods. Its been a long year with many miles and shows. Its hot, and the band is prone to such hallucinatory daydreams. Along their travels, amongst the many highs and lows, they performed on the David Letterman Show, opened for Emmylou Harris, lost as much gear as they’d purchased, been nominated for a Juno award, played festivals from Iceland to Portland, and learned how to make mojitos. Act 3 Interior; recording studio; 3am; 2013; a half-glass of whiskey sits on a Hammond organ. The four members of the Barr Brothers sit behind their instruments in a large wooden room in Montreal–a recording studio built in the 70’s(and decorated as such). They have enlisted the engineering skills of Ryan Freeland(B. Raitt, R. Lamontagne) to help them record and mix their second album, Sleeping Operator. They record everything live, including vocals. By the end of the year, after working in several different studios(including a session in Iceland with Valgier Siguròson(Bjork, Sigur Ros)), and many friends coming in to lend their voices, they will have recorded nearly 40 songs. They will have whittled the album down to 13. Sleeping Operator is a bold, dense release, an expansion on a continuum that they set out upon when they tip-toed into the unknown. At 4am, the drummer types a letter to the head of the record company. It reads: hey _______, I imagine this record may seem a little confounding at this point, but we’re starting to have some clear and united visions of the thing – it’s getting pretty exciting. here’s my current two cents on the work as a whole: in the time since we started making this record with Ryan, there have been two weddings, two babies, many miles clocked on the international road. needless to say it’s been a liberating, joyous, but also intense time for us with a lot of major life changes. this record, to me, reflects a complexity that is perhaps beyond what we’ve done before. not complicated musically, just complex. it has a wooly and warm weight to it – a big soft ruby blanket – a weight that is welcome and liberating– maybe a lot like these changes that we go through as we grow up a bit, build communities and families, etc. we’d like the artwork to be Brigitte’s diamond. this image to me has a primal, yet “from-another-planet” feel to it, and has all of the rust and beauty that we seek in our music. ok, those are my musings from the studio couch. rough mixes on their way! call me if you want to talk. @indysf The tickets will be on sale Friday!